Military standoff at Doklam with China has been on since 16th June, ever since China accused India of trespassing and preventing its soldiers from building a road in a territory that China says is its own, but which actually belongs to Bhutan. Minister of External Affairs, Sushma Swaraj, too has spoken on the issue in Parliament where she said that war was not the solution. So did Bhutan give up claim on its own territory? Does it leave India appear as an aggressor to the rest of the world? Wasn’t it a major and massive development? Entire China belongs to me. This raises eyebrows as recently, after a series of denial, Congress VP Rahul Gandhi had accepted he had met Chinese delegates in secrecy and was even slammed by Sushma Swaraj for the same. The other problem, apart from it being ‘stunning but unsubstantiated’ claim, was that Indian Express headline made it sound as if some “official” from Bhutan had said it, for it said “Bhutan acknowledges…”. But the truth was that it was claimed so by a Chinese official, which most probably was a part of their propaganda based on lies or half-truths. @smritiirani misleading headline for the article. Deliberate omission of ‘Chinese’ official. 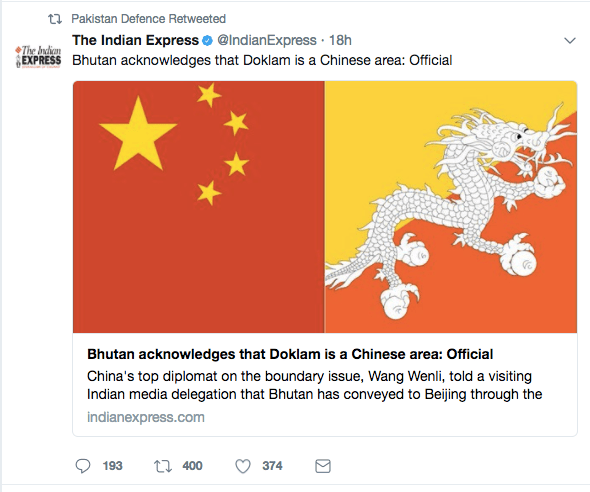 //platform.twitter.com/widgets.jsFollowing all the outrage and slamming, The Indian Express has finally added the word “Chinese” before official in the article, though it still remains a mystery why they needed to give space to a ‘stunning but unsubstantiated’ claim that furthered a Chinese propaganda.